As one of North America's largest orthopedic brace distributors with a huge selection of sports and post operative knee braces, here at MMAR Medical, we work with a variety of sports medicine professionals. Over the years, the MMAR team has had the pleasure of learning about our clients' different sports medicine backgrounds and education. We have been impressed by the myriad of sports medicine options there are, from innovative study programs to amazing residencies around the globe. This got us thinking about the best colleges for sports medicine studies in the US. 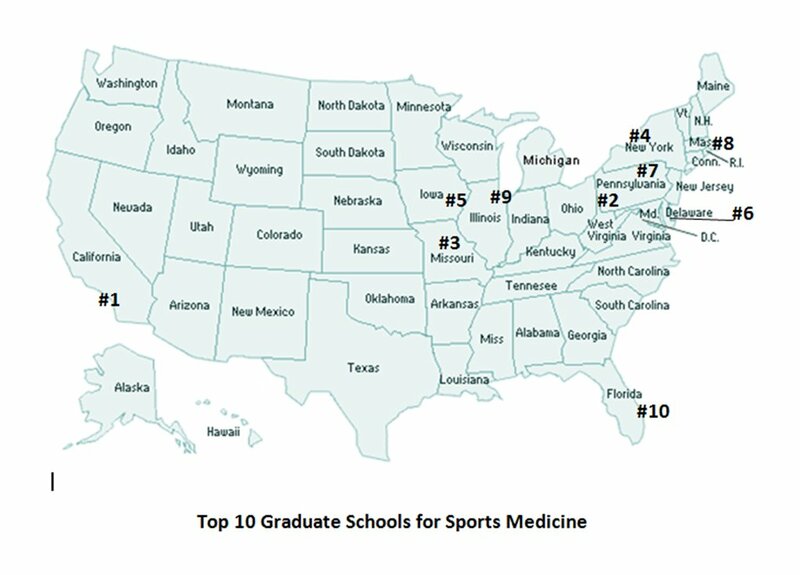 Whether you are a sports medicine professional looking to see where your alma mater falls on the top 10*, or a student looking to discern the right educational path for your sports medicine career, this is a great starting point. For a more extensive list of top 10 colleges, U.S. News and World Report perform an annual rankings list for the nation's best colleges as well as graduate schools. Here is our official list of the Sport Medicine big hitters! The University of South California in Los Angeles, California – Ranked #1 by U.S. News & World Report for Physical Therapy, USC holds many accolades in the PT world that oust other graduate school competitors in the field. For example, USC created the first PhD in Physical Therapy degree program. USC holds a revered research program in the field and offers clinical exposure in Physical Therapy for students and staff. Washington University in St. Louis, Missouri – Washington University tied with Pitt in the U.S. News & World Report for best Physical Therapy schools, but lacks in the prestige for its Orthopaedic Surgery programs. Washington University brags about its unique student learning experience provided in the Orthopaedic Surgery residency program which covers all facets of orthopaedics, allowing for its students to receive a comprehensive and top quality education. The University of Rochester in Rochester, New York – While the University of Rochester hasn’t been recognized for its Physical Therapy school, the Medical Center department of Orthopaedics and Rehabilitation consistently receives one of the top research grants to promote its specialization. It homes one of the few, established musculoskeletal research centers in the United States. The University of Iowa in Iowa City, Iowa – The University of Iowa ranks #3 by the U.S. News & World Report because of its prestige in Physical Therapy programs. Another bragging point for this university is that the students demonstrate a 100% pass rate on the physical therapy licensure exam, which illuminates the schools’ history of academic excellence. The University of Delaware in Newark, Delaware – Delaware also holds top rankings for its Physical Therapy school for its quality clinical education, PhD training program for students and cutting edge research. Arcadia University in Glenside, Pennsylvania – One of the many positives to graduating with a degree from Arcadia University include having studied with an internationally recognized staff. Join the Arcadia Physical Therapy e-Newsletter for up-to-date information and relevant news. MGH Institute of Health Professions in Boston, Massachusetts – Founded by the Massachusetts General Hospital, this graduate school is uniquely designed to work closely with the public health sector. Northwestern University in Chicago, Illinois – Northwestern created the innovative Northwestern University Physical Therapy and Human Movement Sciences division to better the health care and sports medicine field through its education. It is a graduate program truly geared to promote positive change for sports medicine professionals. The University of Miami in Coral Gables, Florida – Miami rounds out our top 10 for best graduate schools for sports medicine due to its high ranking Physical Therapy school. A huge advantage to choosing Miami is the cost benefit; not only do Miami students benefit from one of the lowest tuitions, but Miami has block tuition – tuition costs will be the same for the entire academic experience. About the Author: MMAR Medical Group Inc. is one of North America's premiere medical orthopedic brace distributors, carrying a large selection of medical braces and complimentary rehabilitative cold therapy units. Based in Houston Texas, MMAR specializes in orthopedic braces, including a wide slection of back braces and ACL tear braces for sports medicine professionals and the athletes they treat.